A colour photograph of the north side of the last remaining Camp X building located at 4680 Thickson Road, Whitby, Ontario. 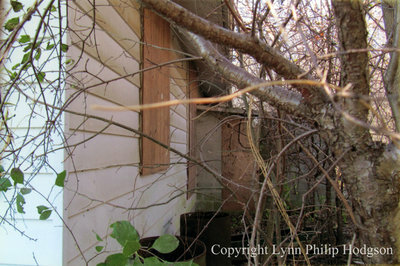 In this view the boarded up windows can be seen as well as a shed attached to the building.Tree branches are obstructing the view. Camp X was a spy training camp and communications centre established by British Security Co-ordination on the shore of Lake Ontario on the border between Whitby and East Whitby Townships. The camp operated from 1941 to 1945. It was used as a government communications centre until 1969. All of the buildings were demolished in 1971-1972 except for one which was moved to 4680 Thickson Road, Whitby, the site of Whitby Animal Services. The North Side of the Last Remaining Camp X Building, c.2012, Lynn Philip Hodgson. Whitby Archives A2017_014_007.